For consumers, the impact of the IoT may be summarised as greater convenience, for example, many people now use contactless payment, something that is enabled by short-range RF communications between a payment terminal and a bank card, mobile phone or smart watch equipped with the same technology. Recently, the introduction of Ultra-High Frequency (UHF) RFID technology has extended that potential. RFID is a contactless technology that can operate over a range from a few centimetres to several metres, using frequencies of 120-150kHz (Low Frequency, or LF), 13.56MHz (High Frequency, or HF) and 860-960MHz (Ultra-High Frequency, or UHF). Most of the existing applications use passive devices; that is, the RFID device does not have its own power source, such as a primary cell. This is the primary feature of RFID devices, while UHF devices use Electro-Magnetic Wave Propagation. Standards organisations are actively developing the standards necessary to make RFID more widely deployable, which includes ISO and IEC as well as EPC Global; in 2009, ISO/IEC integrated UHF EPC Gen 2 into ISO 18000-6 as Mode C.
An important characteristic in RFID system performance is range. Tag range is defined in terms of a successful read/write rate, expressed as a percentage. The rate will vary with distance, but it also depends on the RFID reader’s characteristics and how the operating environment effects the propagation of the signal. In general, read and write ranges are different due to the different amounts of power required by the transponder chip for each of these operations. The main challenges involved with developing and operating a UHF RFID system reside in the reader and the passive tag. Tag limitations include chip sensitivity threshold, antenna gain, antenna polarisation and impedance to match between the antenna and the RFID chip. Reader limitations include EIRP (Equivalent Isotropic Radiated Power) and reader sensitivity. In order to support the use of UHF RFID as an IoT solution, a global alliance was formed in 2014 by Google, Intel, Impinj, Smartrac and AIM (the industry association representing the automatic identification industry). Marketed as RAIN RFID, it has adopted the EPC Gen 2 specification, as incorporated into the ISO/IEC 18000-63 standard. If a solution is referred to as RAIN RFID, it will be using UHF RFID technology that complies with this standard and the alliance’s goals. Toll roads are becoming more common across and by using UHF RFID it is possible to make the payment process transparent. By working together, Avnet Silica, Systems Integrator Kathrein Solutions and Vehicle Identification Specialist Tönnjes successfully developed a system that can identify individual vehicles travelling on a motorway at a range of 20 metres and speeds of up to 250kmh. As such, the technology can be mounted in gantries over the motorway and collect data completely unobtrusively. This can be more reliable and carry a lower TCO than an image-based approach using cameras and vehicle registration recognition algorithms. The system brings together the RRU 4500 UHF RAIN RFID Reader Unit developed by Kathrein, with the IDePLATE and IDeSTIX from Tönnjes, which is also RAIN RFID compliant and enabled by the ‘UCODE DNA’ UHF RFID integrated solution developed by NXP. 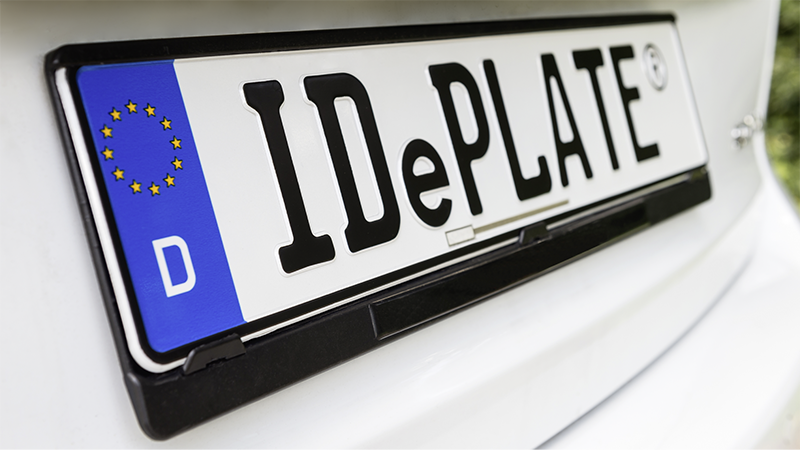 The IDePLATE is a number plate which replaces the vehicle’s existing plate, and contains the passive UHF RFID chip, while the IDeSTIX contains the same technology housed in a simple label that is attached to the inside of the vehicle’s windscreen. Using RFID technology to locate assets can streamline processes, including car rental. With 2,200 branches worldwide and over 144,000 vehicles in its fleet, adding RFID has changed the way car rental company Sixt operates, reducing the average wait for customers picking up the keys to their rental vehicle from three minutes to just 20 seconds. Every conversation about the IoT must also acknowledge the need for security in a more connected world. As the RFID technology has evolved it has introduced greater levels of authentication and cryptography. The latest iteration of NXP’s UHF RFID technology, available through Avnet Silica, is UCODE DNA. This adds high levels of security to its existing long-range UCODE UHF RFID portfolio, combining all the functionality and security into a single IC. It adds two 128-bit AES keys securely stored on the chip, which are used by the on-chip AES accelerator for cryptographic authentication. The keys are stored in an area of memory that is locked at production; the keys can be generated by NXP or by the customer, and are typically used for tag authentication and tag group authentication. In conclusion, as the IoT develops, the benefits of smart tagging using RFID will become more apparent. It will provide new opportunities to increase customer convenience and safety, and offer suppliers a way to differentiate their services while increasing operational efficiency.